We’d love your help. Let us know what’s wrong with this preview of The Someday Birds by Sally J. Pla. But life has been unraveling since his war journalist father was injured in Afghanistan. And when Dad gets sent across country for medical treatment, Charlie Charlie wishes his life could be as predictable and simple as chicken nuggets. To ask other readers questions about The Someday Birds, please sign up. I'd love to know a little more about Charlie (what makes him unusual?) and when in 2017 we can expect to be able to read The Someday Birds. Thanks! Sally Hello and thanks for asking! 12-year-old Charlie is a bird-loving picky-eater who favors cleanliness and routine. At one point he says he figures he…moreHello and thanks for asking! 12-year-old Charlie is a bird-loving picky-eater who favors cleanliness and routine. At one point he says he figures he can "pretty much survive anything, as long as he can order the chicken nuggets" -- the original title of this book was going to be "Chicken Nuggets Across America." Charlie is autistic, but that is not the point of the book. It is just the natural way that he is. He sees the world straight, and honest, and true, and that takes some people by surprise. THE SOMEDAY BIRDS is about Charlie, a 12-year-old bird enthusiast who likes things to always be in order. He ends up being forced to go on a cross-country road trip with his family and meets some new friends along the way. The story is a Disclaimer: I was sent this book by the author in exchange for an honest review. THE SOMEDAY BIRDS is about Charlie, a 12-year-old bird enthusiast who likes things to always be in order. He ends up being forced to go on a cross-country road trip with his family and meets some new friends along the way. The story is absolutely life-changing for both Charlie and the reader. I feel like I'm closing this book with a new perception on life. This story is for middle-school children but the use of two unnecessary swear words by the grandmother at the beginning made me hesitate to read this book. But I'm glad I continued, no more foul language, and a delightful story through and through for any age. Without the harsh swear words, which I doubt the grandmother would have choose to use, this story would have been just as good, if not better. Among the charms of this debut novel is the generosity with which Sally J. Pla writes about twelve-year-old Charlie, a sweetly nerdy kid who understands that his deep need for order and compulsive hand-washing complicate his life and drive his family nuts. (He seems to be on the autism spectrum, but Pla wisely doesn't label him.) She also brings compassion to Charlie's exasperated family. And his transformation in the book involves awakening his own empathy for others, including a three-legged d Among the charms of this debut novel is the generosity with which Sally J. Pla writes about twelve-year-old Charlie, a sweetly nerdy kid who understands that his deep need for order and compulsive hand-washing complicate his life and drive his family nuts. (He seems to be on the autism spectrum, but Pla wisely doesn't label him.) She also brings compassion to Charlie's exasperated family. And his transformation in the book involves awakening his own empathy for others, including a three-legged dog that he comes to loves despite its smelly fish breath. Charlie has managed to organize his life in a way that keeps his anxiety from overwhelming him. That all changes when his dad, a journalist injured in Afghanistan, needs surgery, and Charlie's forced into a cross-country road trip with his three siblings and the strange pink-haired woman who's taking care of them. Charlie and his dad share a love of birds. To give himself an anchor on the trip—and, in a touching bit of magical thinking, to make his dad well—he decides he has to look for every bird on a list they've made of "someday birds," rare birds they hope to see once in their lives. The experience of reading The Someday Birds is intense and intensely satisfying. Within the first few pages you fall for the main character, Charlie, who narrates the tale. Charlie is a reluctant hero, dragged into a journey, travelling across the country in a vintage RV named Old Bessie along with his three siblings, a three-legged loveable hound rescued in Las Vegas, and a strange young woman called Ludmila. Their final destination is a hospital in Virginia, a place where Charlie’s dad may or The experience of reading The Someday Birds is intense and intensely satisfying. Within the first few pages you fall for the main character, Charlie, who narrates the tale. Charlie is a reluctant hero, dragged into a journey, travelling across the country in a vintage RV named Old Bessie along with his three siblings, a three-legged loveable hound rescued in Las Vegas, and a strange young woman called Ludmila. Their final destination is a hospital in Virginia, a place where Charlie’s dad may or may not recover from a brain injury. Charlie’s dozens of quirks annoy his companions to no end yet make him incredibly endearing. He doesn’t like change and frequently resorts to a ritual hand-washing that sooths his overloaded senses. Like most reluctant heroes, Charlie has a mentor -- none other than Tiberius Shaw, PhD, legendary ornithologist, artist and philosopher. Throughout the novel and especially at the beginnings of chapters, Shaw offers threads of wisdom that apply to both bird and human habits. Along Charlie’s journey, readers also meet brilliant scientists who teach Charlie about the stars, humanity, and aviary genomics. This book is chock full of delightful moments, heartwarming stories, and fun facts. It’s definitely a book I’ll read again! With wit and sensitivity, Pla gives her readers a ride in the skin of hand-washing, chicken nugget-eating, bird-loving Charlie on his way across the US in a rickety RV named “Old Bessie,” along with his siblings, a three-legged dog and a new "family friend" who also might be taking them to a mountaintop cult. Through their cross-country adventures, the reader gets a real sense of what it’s like to be … well… Charlie. His “condition” never gets labeled, and I like that. We get to see how the world With wit and sensitivity, Pla gives her readers a ride in the skin of hand-washing, chicken nugget-eating, bird-loving Charlie on his way across the US in a rickety RV named “Old Bessie,” along with his siblings, a three-legged dog and a new "family friend" who also might be taking them to a mountaintop cult. Through their cross-country adventures, the reader gets a real sense of what it’s like to be … well… Charlie. His “condition” never gets labeled, and I like that. We get to see how the world looks through his eyes, how he tries to create order in his seemingly disordered life. His siblings respond to his habits as family members do: sometimes with impatience, sometimes with understanding, and, under it all, with love. The relationships in this book feel real, and there is just enough wondering what will come next to keep the reader in that beat-up camper as it makes its way across the United States. This book is sure to become a favorite with young people, their parents and teachers around America—maybe even the world! A character can elicit so many different emotions in a reader regardless the story, but when the two come together, you just don't seem to want it to end. In Sally Pla's debut novel this is most certainly the case. The main character is one that you make an instant connection with and just want to know more and more about. In fact all the characters in Sally's novel are so unique and interesting. The story is is unique and has you making connections not only with geography but science and ornitho A character can elicit so many different emotions in a reader regardless the story, but when the two come together, you just don't seem to want it to end. In Sally Pla's debut novel this is most certainly the case. The main character is one that you make an instant connection with and just want to know more and more about. In fact all the characters in Sally's novel are so unique and interesting. The story is is unique and has you making connections not only with geography but science and ornithology as well. This book was funny, poignant, bittersweet, and wholly lovable. A fantastically whimsical premise with an equally strong delivery and full of unexpected twists and turns that will tug at your heart. A great addition to any middle grade bookshelf! I have a feeling this will hang on as one of my favorite MGs of the year. Truly a beautiful story with rich and memorable characters. This book had my heart from the beginning and held on tight. I loved every single thing about it. The cover art will draw you in. The interior pages will make you stay. 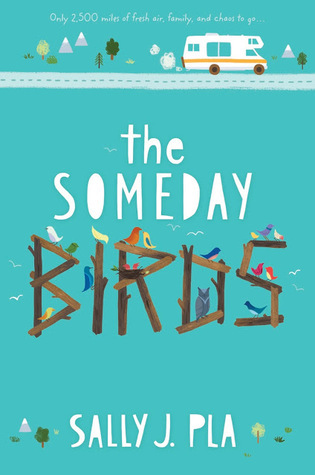 The Someday Birds is a charming, original, middle-grade debut that this fifty-something reader devoured in a sitting. The author has succeeded in creating lovable, believable characters. One in particular, 12-year-old Charlie, will remain indelible for many reasons, not least of which is his keen worldview. When his father is moved from California to Virginia for treatment of a war-related traumatic head injury, Charlie sets o The cover art will draw you in. The interior pages will make you stay. When his father is moved from California to Virginia for treatment of a war-related traumatic head injury, Charlie sets out on a journey across the country in a rickety RV with his teenage sister, rowdy twin brothers, and a mysterious family friend, Ludmila. He decides that if along the way he can spot all the birds that he and his father were hoping to see someday, his father will recover. Readers have a chance to take that journey with Charlie and will find themselves celebrating each of his victories on the 2,500 mile excursion. This is a story of compassion, family, hope and humor. It’s also about behavioral idiosyncrasies, the impact of war, a three-legged dog and the calming effect of chicken nuggets. The author has masterfully woven seemingly disparate elements together and in doing so created a quirky, intensely readable novel with heart. The book is interspersed with gorgeous illustrations, prophetic quotes from a reclusive ornithologist, intriguing chapter headings, and scientific information related to the birds on Charlie’s list, making the story educational as well as entertaining. 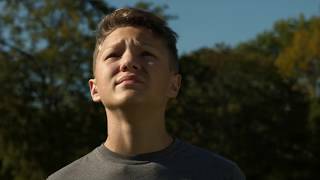 The Someday Birds is a touching story of a boy named Charlie learning how to open his mind to new experiences and emotions as he and his siblings traverse the country. In the beginning, Charlie is full of fear. Fear of the unknown, fear of change. As he gets closer and closer to his father and to completing his "Someday Birds" list, we see Charlie's fear melt away. All of the new people and all of the new experiences Charlie has over his journey really changes him. I personally think that this s The Someday Birds is a touching story of a boy named Charlie learning how to open his mind to new experiences and emotions as he and his siblings traverse the country. In the beginning, Charlie is full of fear. Fear of the unknown, fear of change. As he gets closer and closer to his father and to completing his "Someday Birds" list, we see Charlie's fear melt away. All of the new people and all of the new experiences Charlie has over his journey really changes him. I personally think that this story is not about a father injured in Afghanistan, nor is it even a story about birds. This is a story about a boy who suddenly realizes that there is much, much more to life than what he has seen. I want to recommend this book to anyone who likes novels that are fast-paced. I felt that the characters in this novel were constantly moving from one thing to another, always on the go. There wasn’t a lot of time to appreciate or analyze the situation they were currently in before they were onto the next best thing. I found this frustrating at times as a reader but I also understood they were on a journey, an adventure, and with a vanful of children, you need to live each day to its fullest. Th I want to recommend this book to anyone who likes novels that are fast-paced. I felt that the characters in this novel were constantly moving from one thing to another, always on the go. There wasn’t a lot of time to appreciate or analyze the situation they were currently in before they were onto the next best thing. I found this frustrating at times as a reader but I also understood they were on a journey, an adventure, and with a vanful of children, you need to live each day to its fullest. This novel is also geared towards children/middle school readers who like that continual change of scenery and this novel definitely provided that. The story is told by twelve-year-old Charlie who has some OCD behaviors. He has an older sister and two younger brothers. His father, a journalist, came home from Afghanistan with a brain injury. I enjoyed that the story took off right away with Gram staying with the children while dad is getting treatment in the hospital. Dad is offered additional free treatment across the country where they decide he will go, with Gram accompanying him. The childcare situation doesn’t pan out and the strange woman who was visiting their father in the hospital ends up coming to their house to babysit. The kids decide then that they’re not staying with her and set out to be with their father. Road trip! The fast road trip to reach their father ends up becoming a scenic drive as one thing leads to another. The children find themselves finishing their road trip in a dusty camper with a three-legged dog. You have to enjoy their adventure on this scenic drive as each individual has desires they want fulfilled along the way. It’s comical at times as they stop to enjoy the sights. Charlie’s obsession with birds, the twins’ obsession with anything that catches their eye, and Davis’ obsession with boys. I had to wonder if they would ever reach their father. I thought the ending was super and one of the best parts of the novel. I liked how realistic the children felt and their interactions with one another. The mystery of Ludmila was a mixed bag for me. Why was she sent to watch the kids when they didn’t know who she was? I found this frustrating and that frustration grew the more I read about her until her relationship was finally revealed. I really liked the part where Davis shows Ludmila the flash drive, I got chills just reading this. I wished there would have been more depth to the characters, a chance to get to know them better. Middle grade novel about a twelve-year-old boy on the autism spectrum, who also struggles with OCD, on a road trip wth his siblings to visit their brain-injured father. The family dynamics are superbly crafted. Charlie's love of birds is woven throughout the entire story, in ways that readers can appreciate even if they are not birders themselves. It's extremely challenging to write an entire novel with a protagonist who struggles with mental illness, but Charlie's characterization is accurate, Middle grade novel about a twelve-year-old boy on the autism spectrum, who also struggles with OCD, on a road trip wth his siblings to visit their brain-injured father. The family dynamics are superbly crafted. Charlie's love of birds is woven throughout the entire story, in ways that readers can appreciate even if they are not birders themselves. It's extremely challenging to write an entire novel with a protagonist who struggles with mental illness, but Charlie's characterization is accurate, sensitive, endearing, perceptive despite his limitations, and evokes empathy. Charlie is an unlikely hero who is certain to instill sensitivity in his readers. Writing is high quality. Happy but realistic ending. My only (rather small) gripe about this book is my wish that a map of their route from San Diego to Washington DC was included. This novel is my favorite (so far) for the 2018 Newbery. What a beautifully written debut! Charlie, is a highly sensitive 12 year old on the autism spectrum who adores birds. His quest to find birds calms the anxiety he has about his Dad's brain injury. As Charlie hopes for his father to heal, he takes a literal and figurative journey to understand other people and relationships. The lyrical words and heart in this story will compel you to turn each page. LOVED this book! THE SOMEDAY BIRDS is enchantingly wise and lovely; it was impossible not to fall head-over-heels for Charlie, his family, and the incredible cast of characters they meet along their journey. Pla takes a story filled with difficult challenges and writes it with such sensitivity and heart that I wanted to hug the world by the time I was done. A fantastic, life-affirming debut. This is a charming book. Written in the voice of the main character, who is probably on the autism spectrum, it gives us a birds-eye view (no pun intended!) of how a person with autism walks through life's difficulties. A wonderful book, actual journey, metaphysical journey, war, peace, fear, hope, acceptance and growth. Starts a bit slow but stick with it until the journey up the mountain to the possible cult and you will be hooked. Easily the best middle grade I've read this summer! This was a lovely, sweet, authentic story about a boy who ends up on a cross-country road trip with his older sister, twin younger brothers, a stray dog, and their guardian, a woman who started showing up in their father's hospital room even if they don't understand how on earth she could be connected to him. Charlie is a boy who likes things a certain way. He likes his room. He likes to study birds, but usually from the safety of inside his house and by looking at his trusty bird books. He admir This was a lovely, sweet, authentic story about a boy who ends up on a cross-country road trip with his older sister, twin younger brothers, a stray dog, and their guardian, a woman who started showing up in their father's hospital room even if they don't understand how on earth she could be connected to him. Charlie is a boy who likes things a certain way. He likes his room. He likes to study birds, but usually from the safety of inside his house and by looking at his trusty bird books. He admires Dr. Tiberius Shaw, a renowned bird expert. He washes his hands 12 times each, because he's 12. He likes chicken nuggets, because they are safe, normal, and usually pretty predictable. And now, he is being drug along on a trip from San Diego to Virginia with his loud chaotic family to visit his dad who has been sent to a world renowned neurologist there. The hope is that they will get some answers to his dad's TBI. Charlie decides to use this as a chance to work on his "someday birds" list-the list of birds he and his dad hoped to see someday in real life. The trip ends up being about more than just getting from Point A to Point B. Charlie learns about himself, his role in the family, and what it means to understand someone else. I have a seven year old daughter who was diagnosed with autism when she was three, so I was really drawn into this book from the very first moment I heard about it. I knew I would absolutely love Charlie's character, and I couldn't wait to see what kind of adventures he was going to have in The Someday Birds. This novel is full of hope and family, and the importance of sticking together in the midst of a crisis. Check out this and other reviews on my young adult book blog, Here's to Happy Endings! This novel is full of hope and family, and the importance of sticking together in the midst of a crisis. It's also about Charlie, our twelve year old narrator, who is forced into a cross country trip by his sister and younger brothers, to go to Virginia, where his father is at a hospital receiving treatment for a brain injury. The whole idea for this book just sounded charming and heartwarming, and I'll be completely honest - it was definitely a sweet book that made me appreciate my own family and those who may not be related to me, but who are like family anyway. "Bird behavior is pretty consistent. You can write it down, know it, understand it. No matter how hard you try, you can't do that with people." Twelve year old Charlie knows birds. He knows what they look like, how they act, and he spends a good portion of time learning new bird facts and drawing a variety of species. In fact, this is something that she shared with his father - before the accident that landed him in the hospital and left him with a brain injury that stole who he was. Now Charlie feels alone, and as if he can't really understand a lot of what is going on in the world, or the people in it. He often has trouble with sarcasm, visual cues, and body language, and conversations can be difficult for him. His father understood this in ways that no one else was able to, and since his father is now in the hospital, Charlie has been left with his grandmother, older sister, and younger twin brothers. One day, his grandmother informs them that his father will be moved to a hospital in Virginia, because they believe they may be able to help him there. So his grandmother goes with them, leaving Ludmila - a woman who has strange ties to his family that no one knows about except his grandmother - in charge. None of the kids like Ludmila, and Charlie's older sister convinces her boyfriend to take them across the country to meet up with their grandmother. However, an accident and an argument causes that play to go awry, and when their grandmother is informed, she sends Ludmila to fetch them. While Charlie just wants to go home and wait - back to his familiar bedroom, food, and routine - Ludmila was instructed to pick up an RV and take them on a cross country journey to get to the hospital. Along the way, they run into all sorts of crazy adventures, and Charlie makes the best of this forced journey - checking off a list he and his father had come up with titled "The Someday Birds" - a list full of bird species that he and his father would have loved to see. From birds that are extinct to birds that are still around in the wild, Charlie works his hardest to check out off as many as he can, despite the way his family feels about it. While they travel, seeing landmarks and exploring, Ludmila slowly begins to tell her tale - the tale of her childhood and how she had come to know their father. It is a heartbreaking tale full of sadness and bad memories, but it is full of depth and is a vital part of the story. The book is told from Charlie's point of view, and it's obvious that no matter how much he loves his family, he often feels like he doesn't really fit in with them - at least not the way that he fit in with his father. He gets teased, made fun of for his habits (such as his counting, hand washing, and eating habits), and no one wants to indulge him in his desire to check the birds off of his list, because he beleives that when he sees his father, it will make him feel better and bring him back to his old self. The amount of love that Charlie has for not only his father, but for the rest of his family, is simply heartwarming. Charlie might have a difficult time portraying emotions, but his heart is deep and he knows how to be sure his father knows he is loved. He takes risks, he does things that he hates, and he has to use some pretty grimy bathrooms on his trek across country with his family. I really loved Charlie's character (in case you can't tell), and I thought that this entire book is a fun and heartwarming read not just for middle graders, but for adults, even. It's funny at some spots,and it's definitely full of personality. This is definitely a must read for anyone who has someone in their lives who has autism, as you will be able to relate to Charlie and it makes the book seem that much more personal. You can tell the author really did a lot of research and put a lot into this book, as it was carefully written and created with a lot of love. Pla, Sally J. The Someday Birds. Harper Collins, 2017. Charlie has a set routine that he thrives on, but when his father is injured overseas and is sent to a hospital across the country, everything about Charlie's routine is thrown off as his family adventures across the country to reunite with his father. I love Charlie and I love the way his family usually accepts his differences and is willing to accommodate him. The cross-country road trip descriptions were accurate, and Charlie's obsession wi Pla, Sally J. The Someday Birds. Harper Collins, 2017. Sally J. Pla is the award-winning author of "The Someday Birds," recipient of the 2018 Dolly Gray Children's Literature Award for its authentic portrayal of disability. It's a NY Public Library Best Children's Book of 2017, a Bank Street Best Children's Book of 2017, a Goodreads Choice Nominee, a Junior Library Guild Selection, and Nerdies award winner. It has starred reviews and appears on severa Sally J. Pla is the award-winning author of "The Someday Birds," recipient of the 2018 Dolly Gray Children's Literature Award for its authentic portrayal of disability. It's a NY Public Library Best Children's Book of 2017, a Bank Street Best Children's Book of 2017, a Goodreads Choice Nominee, a Junior Library Guild Selection, and Nerdies award winner. It has starred reviews and appears on several state awards lists. Sally's second novel, "Stanley Will Probably Be Fine," is also a Junior Library Guild Selection with a starred review from Kirkus, which said, "add to the list of intelligent books about kids whose brains operate outside of the norm." Sally's first picture book, "Benji, The Bad Day, & Me," will be available from Lee & Low in September 2018.